By providing a showcase for local agricultural excellence and new farming technologies, agricultural societies, and the fairs they organized, were an important element in the success of Manitoba's agricultural sector. The annual agricultural fair was also a vital social institution, often second in importance only to the church for facilitating interaction and hosting community events. Constructed in 1904, the Old Minnedosa Agricultural Society Display Building is a good example of the type. Its open interior spaces provided ample space for the display of displays and products. The standard construction seen outside—wood frame—is exposed inside, where exposed rafters in the cupola create a visually complex structure. The Display Building is one of only a few remaining Manitoba buildings designed on an octagonal plan. That eight-sided plan was very popular between 1880 and 1910, especially in the United States. The form was thought to be more efficient than rectangular plans, both in terms of construction costs and in providing better ventilation and lighting. 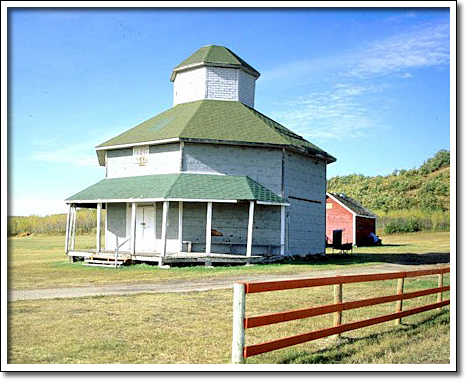 While used on all manners of buildings—houses, farm outbuildings, public buildings—in Manitoba the octagon was seen mostly on a few barns and display buildings.